It was my dad’s birthday last week and I wanted to make something for him to celebrate the occasion. He’s a breakfast kinda guy, especially breakfast baked goodies. He’s also a huge fan of anything almond-y. 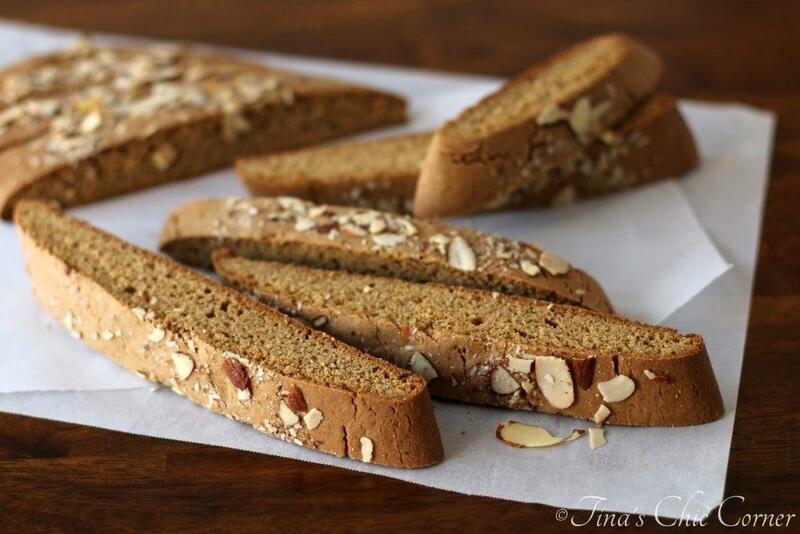 Do you remember my Almond Biscotti? I made those with him in mind. I’ve combined the best of both worlds and made him this sweet almond pastry. 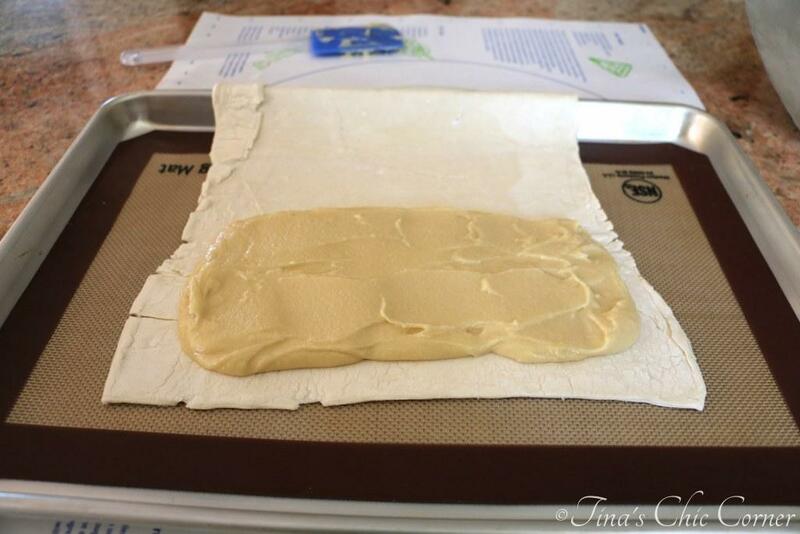 Lay parchment paper or a silicon mat on a baking sheet and set it aside. In a food processor, add 1 egg, almond paste, sugar, and vanilla extract and blend until all of the ingredients are well combined and smooth. Place the short side facing you. Spoon the almond mixture on the bottom half of the pastry, keeping a 1 inch border from the edges. On the top half of the pastry, cut 2 inch long slits, about 1 inch apart. Seal all 4 sides by pressing the edges together with a fork. Bake it in the preheated oven for 10 minutes. Reduce the oven temperature to 375 degrees F and bake it for an additional 20 minutes or until the pastry is a golden brown. (Optional) Once the pastry has cooled, sprinkle with powdered sugar. 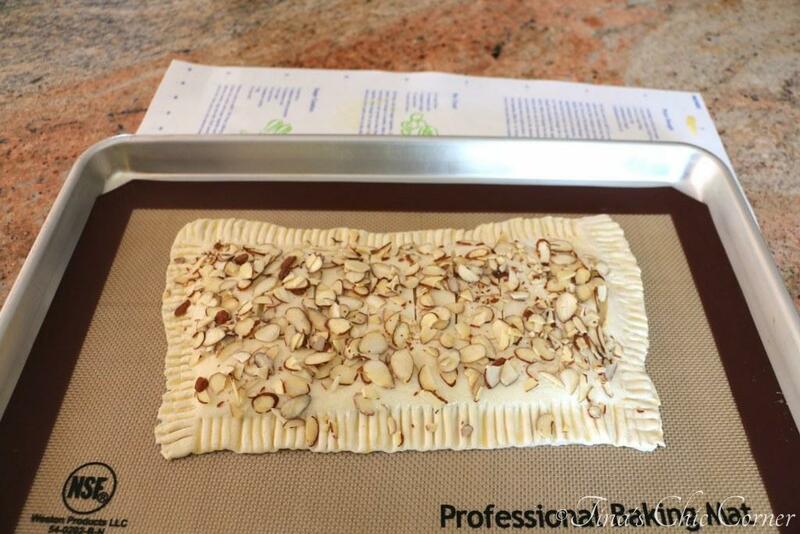 After you roll out the pastry dough, place it right onto the baking sheet. I find that it is easiest to prepare it this way so that you don’t have to move it again when it’s all full of almond filling. Almond paste is mostly just ground almonds and sugar. This stuff is intense. Meaning a little of it goes a long way. Mmm, it already smells super almond-y in the kitchen. 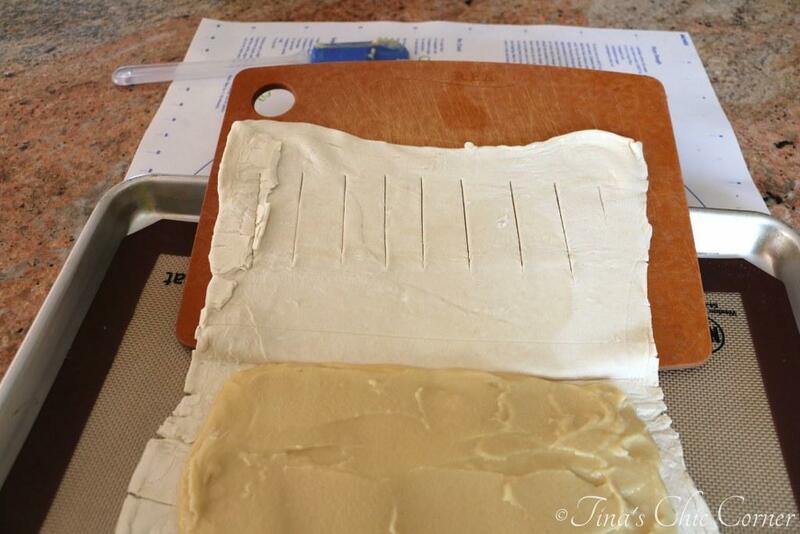 I placed a cutting board underneath the top half of the pastry dough in order to cut the slits easily. This trick also helped me to avoid tearing the fragile dough over the edge of the pan. The pastry is out of this world delicious. Who doesn’t like buttery layers of fluffy pastry? The rich almond filling is smooth, tender, and wait for it, almond-y. 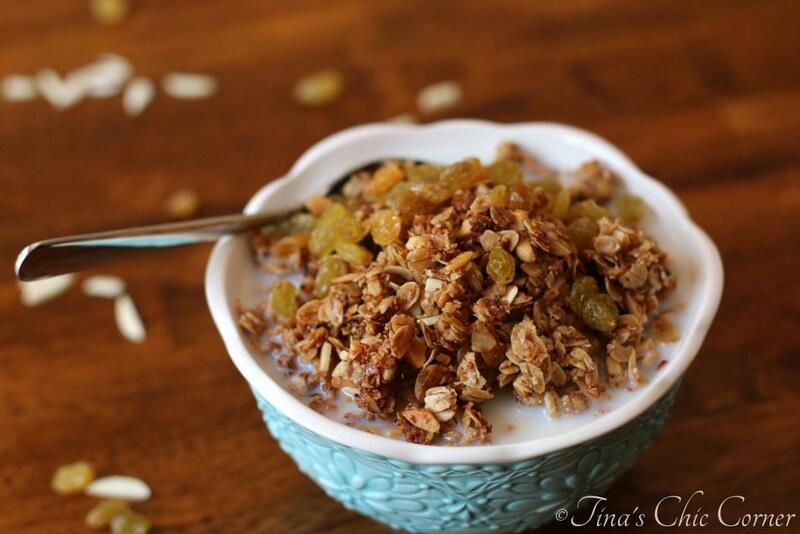 The toasted almonds on top add a nice crunch and enhance the almond flavors. It’s sweet, but not overly so which is a good thing when it’s being used as breakfast if you ask me. Although feel free to go ahead and enjoy this for dessert too! I included more photos than normal (and I’m sure my husband will tell me to edit some out), but I felt like a wedding photog trying to get the perfect pictures on a day that only happens once. It was almost impossible to get it down to these few. Here are some other lovely almond treats. 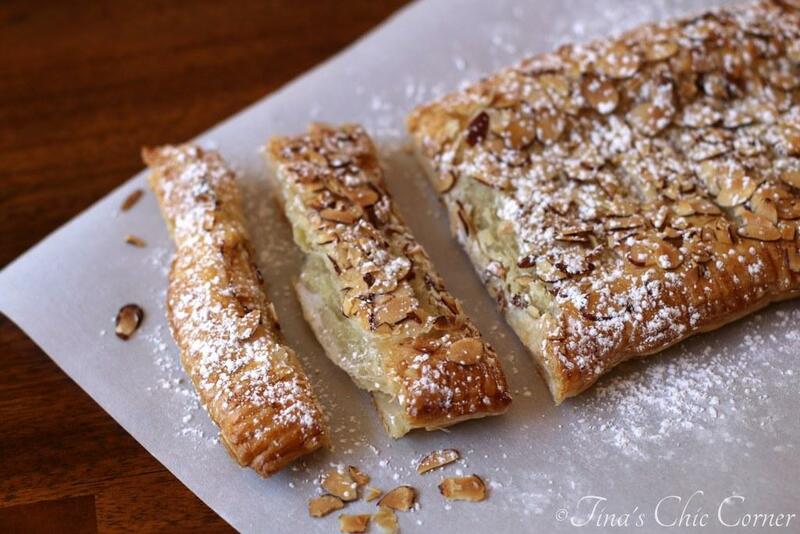 This pastry looks amazing, Tina! 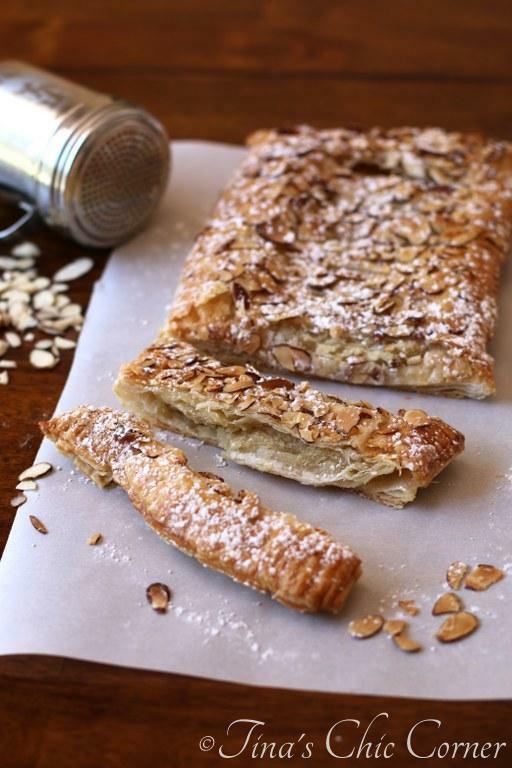 I LOVE almonds and anything pastry is SO up my alley. This is my idea of an awesome weekend breakfast! Gorgeous pics too, girl! This will be a big hit for my youngest. She is a big time fan of almond deserts and snacks. I am 100% an almond lover so I would be alll over this! You’re making me want a piece with a cup of coffee right now 🙂 And I have that same powdered sugar sprinkler on-er! haha Happy friday! Haha… I’ve been meaning to get a new sprinkler can because the top is so hard to get on and off. I’m an almond lover Tina. This looks amazing and I bet it’s fabulous. Your dad is lucky to have you. This looks really yum Tina! So flaky! Sign me up! This looks so so so amazing! Love how delicate the pastry is! Puff pastry makes such fun treats! The texture is perfect for the almond flavor. What a wonderful gift for your dad, Tina! you can never go wrong with a good pastry.. yum, this looks delicious. 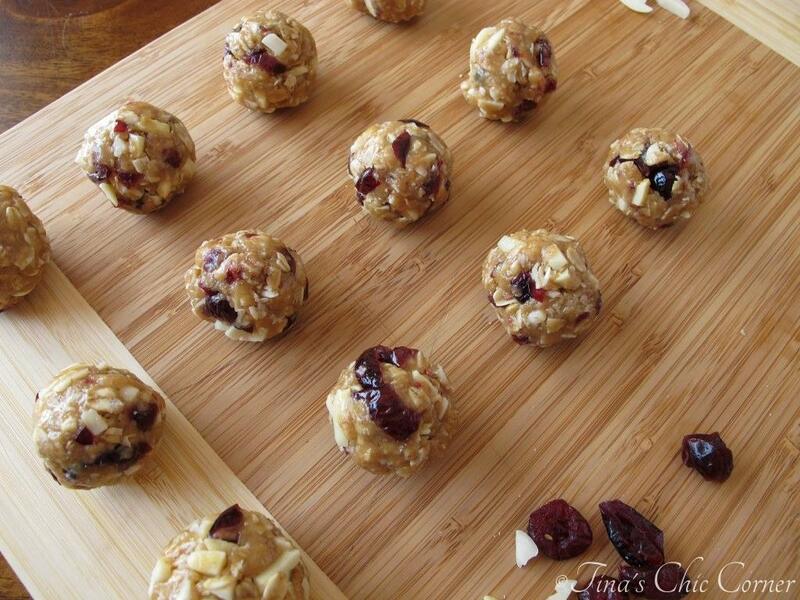 thanks for sharing a great recipe + idea! This looks so great. I love the flavor of almonds. I’ve never worked with almond paste – I’m going to have to try your favorite brand and then make this ASAP. I want a piece right now! Hope you are having a nice and relaxing Sunday! Thanks so much Cate! My weekend was amazing! I met up with my family in Lake George. Getting up to go to work this morning was tough. This looks awesome Tina! I love the step-by-step photos! It makes it look easy to make and I’m loving the flavor combination! This looks amazing, Tina! I am an almond lover especially when they are jam packed into flaky pastries so I would definitely not be able to resist this. It sounds delicious! Love, love, love this. What an elegant dessert to serve. Thanks, Tina.